Principal Investigator, Grace Tsai, recently returned from the European Association of Archaeologists in Barcelona, and the III Congress on the Anthropology of Salt in the Basque Country to present work on the SBSB Project. Meanwhile, back in Texas we have been hard at work gathering data, running tests, and collecting salt samples. 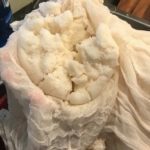 In particular, we were asked to do an interesting task that you can read more about below–making sea salt from scratch! “Sea salt is made by boiling and evaporating sea water over the fire. Bay salt, by evaporating sea water, in pits clayed on the inside, by the heat of the sun. Basket salt is made by boiling away the water of salt springs over the fire. Rock salt is dug out of the ground […]” (Mason 1775). Although there were at least four variations of salt available during the pre-industrial era, several recipes, such as John Collins’ Salt and Fishery (1682), specify the use of bay salt for meat preservation, as opposed to salts made using other methods. To understand why bay salt is unique, we decided to recreate or source the different types of salts, starting with sea salt, the topic of today’s post. Why are we looking at salt, you might ask? 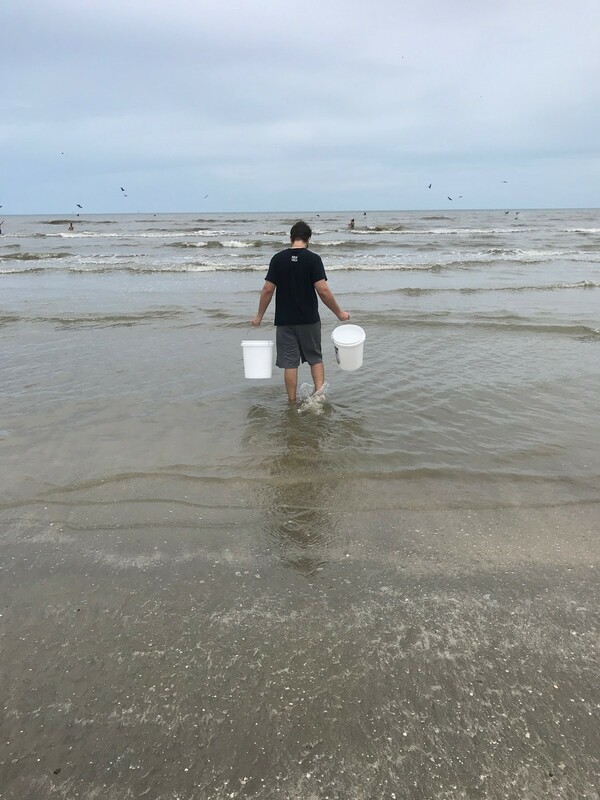 John collecting sea water in Galveston. Salt was a VERY important method of food preservation in the 17th century. In fact, it was commonly used on long sea voyages to preserve many types of meat and fish. As such, examining the mineral content of the various salts that sailors used is incredibly important. Ideally, it will allow us to better understand the way in which salting impacted the nutrition and health of 17th-century sailors. 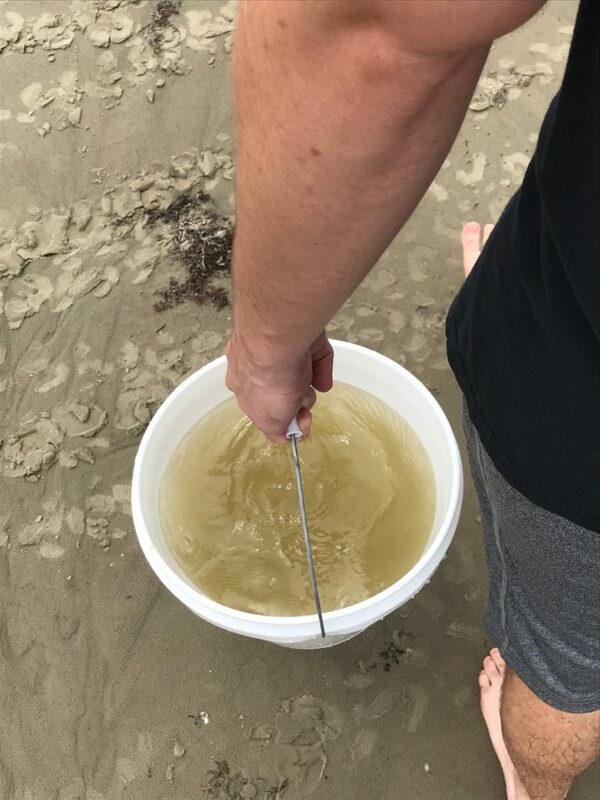 This past summer, we, John McQuitty and Emelie Nelson, traveled to Galveston, TX to collect salt water for the Ship Biscuit and Salted Beef Research Project. The water was obtained from the second sandbar, collected in two five gallon buckets, and then subjected to a salt extraction process. A bucket of sea water for salt extraction. As the boiling process continued, the water became progressively more cloudy, likely from the increase in salt concentration. After a few hours of boiling, the first signs of crystallization occurred. These crystals appeared to be flaky and white in color. The nearly completed sea salt product. The pot, containing the salt crystals and remaining water, was allowed to cool and then was immersed into an ice bath to facilitate the crystallization process. 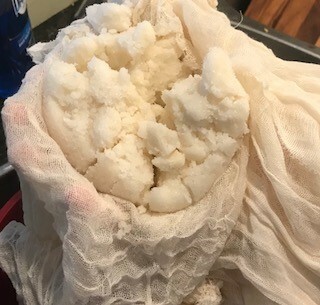 After the crystallization process was complete, the salt was strained through a cheesecloth to remove any excess water. All salt crystals were then stored in sterile bags. The salt crystals were then analyzed to determine their percent mineral content. These results are displayed in the table below. All values, excluding nitrogen, were recorded in parts per million. The nitrogen content was measured as % N of the sample. In the upcoming weeks, team members of the Ship Biscuit and Salted Beef Research Project will interpret the mineral analysis results. Furthermore, research will be conducted to determine if the mineral content of salt could have impacted 17th-century sailors’ health.